The Broughton's full service Marina with Fuel, Liquor and General Store! We are a unique floating village located off the North Coast of Vancouver Island on the edge of the Broughton Archipelago. 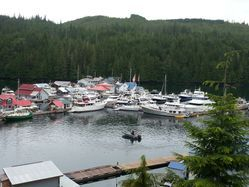 Sullivan Bay is nestled in the midst of high mountains, long fiords and deep channels. With the wonder of nature visitors are bound to see whales, dolphins, eagles and many more wonders. 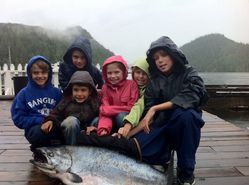 Experience the world class fishing for halibut, salmon, crabs and prawns! Visit us by boat or float plane! The West Coast's Best Fishing! Still offering: Stay 2 nights, 3rd night footage free/just pay power!